Ho ho ho, Santa is not far away! Yeah, I am getting ready to feel the Christmas spirit, so I changed the bloglayout. Cannot give the link for the kit yet, it's made with a new kit, will be posted in December. But first of all I will have to say to you, that for a change, tomorrow I will have a post too. 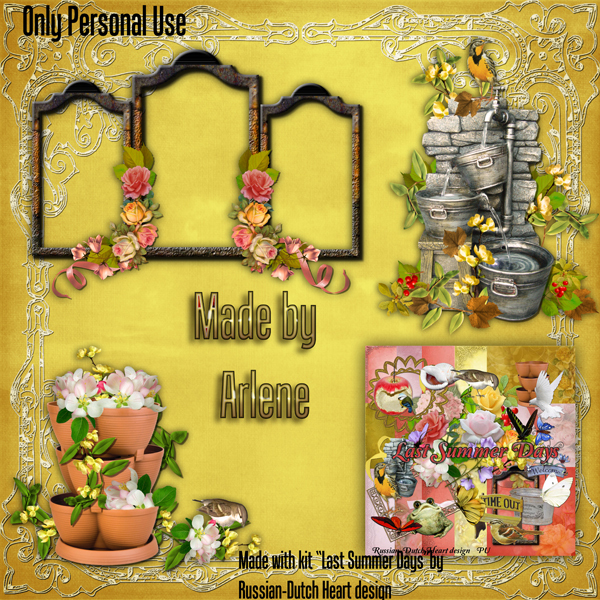 It is the start of the WORLD WIDE CHRISTMAS SCRAPBOOKING FREEBIE BLOGTRAIN! 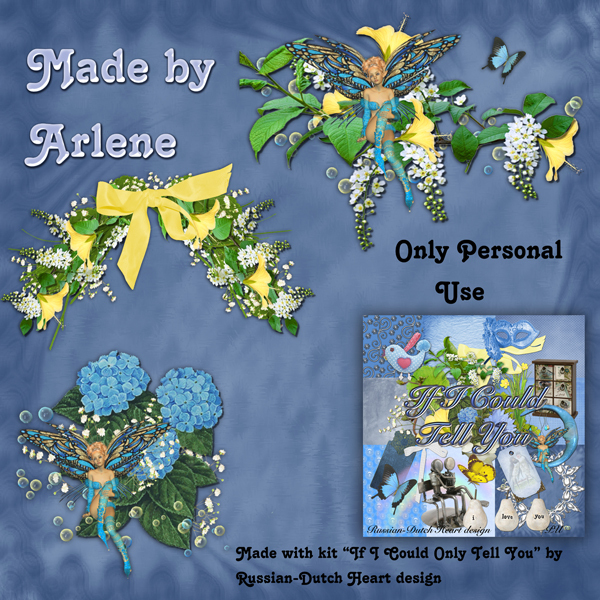 So tomorrow you will have my 1st Christmaskit together with marvellous clusters from Arlene. And then you will have to click the logo in the sidebar and look for all the other contributions. Perhaps you will have to return to the blogtrain blog a bit later, because we are in different time zones, so not everybody will have it ready at the same time! Short update for Jan: He went to his doctor yesterday, his blood was not showing any strange values, so far so good( because of the higher dosis of his watering pills). He still has to do the heart function test, will be next week. He is feeling aweful tired, but that can be the result of his health condition at the moment. All is still under control, he is loosing slowly slowly a bit of fluid, but not enough yet. Oh well, we will have to be patient. He has to keep track of his weight on a little list, each day, his doctor wants to keep an eye on that too. He can loose some each week, but it must not go too quick either. I did finish two other blocks for the blanket too, will show them next week okay? I have one with a cable pattern in it, whch I like very much. Also started a new kit, which I hope to finish this weekend and oh wow, I got a load of new clusters from Arlene, some to match some kits, some made of several kits(specially Christmas yeah!). So this month you will have some lovely treats! cartilage from his knee, and told him he has a small tear in the cross band in his knee. That last thing has to disappear with lots of rest. Hopefully after a few weeks he will be able to walk again without problems or pain. Of course for now, he is still on some painkillers, it's hurting a lot. Heidi and I didn;t get a big chance to talk as we usually do, somehow it's not the same when a husband and child are around, is it? Perhaps she will find a moment this weekend or next week, to come to me, then we can talk about everything LOL! Okay new kit time. Another one in my favourite color, yes, purple. 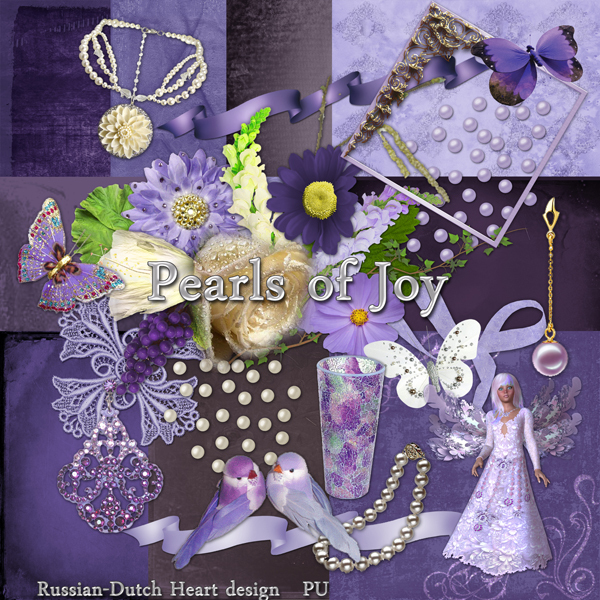 It's named "Pearls of Joy", and has matching clusters from Arlene. 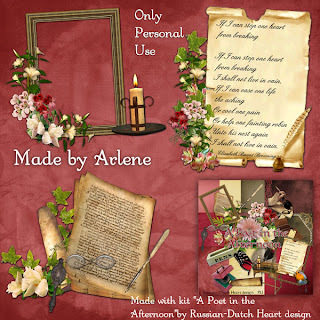 Don;t you love the page border she has made? You can see it on the preview. Oh, wanted to say this too! 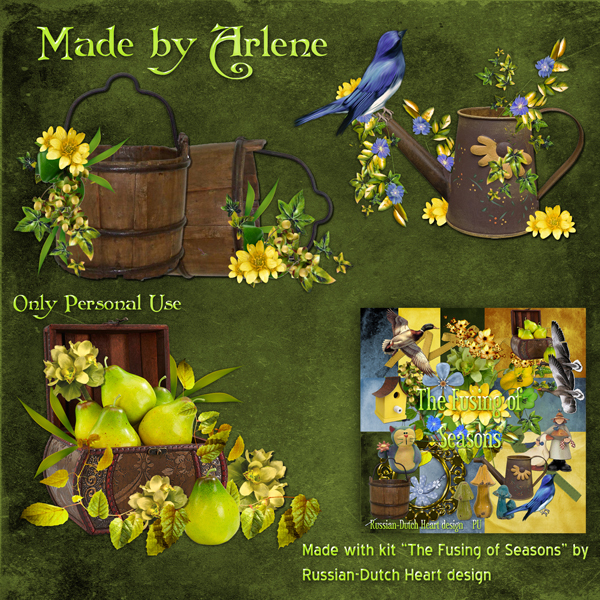 If you want to download some kits from last year, do it quick, because I will remove soon the links in the My Freebies list from July, August. 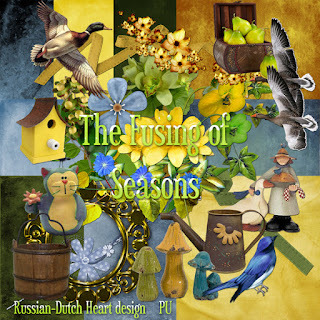 September and perhaps October 2011.! That's all folks. Don't forget to come back tomorrow for the 1st. Christmas kit. We are moderately happy again LOL! Thanks to the people who mailed me about the dvd issue! But....believe it or not.........it's working again! How???? No idea!!! But it was good to see the surprised smile on Jan's face when he turned the thing on, went to the guide plus menu and tadaaaaaaaa....... it was there. I can show you already two blocks for my blanket-to-be. Yes, I feel like Speedy Gonzalez, almost LOL! Now these two patterns are not the most difficult, but you have to start somewhere, hmmm? They are about 23 cms( 9 inches) in square, so you can imagine I will need A LOT more! Finally got a few things done yesterday. First I went out to put a bill at the bank, and found another Christmas present, and returned home. Jan had to go to hospital to give another blood sample(tomorrow he has an appointment with his doctor again) and he went there on his bike! I asked him how it went, if he had a lot of trouble, or perhaps pain, but he said it wasn;t too bad. Okay, may be slowly he can practise that again. But still I could tell it didn;t go as smoothly as he told me, he was pooped out a bit when he came home, did have a good nap on the couch! In the mean time I changed the bedsheets, now first have to turn the normal laundry in the machine, otherwise the sheets will not fit. Perhaps somewhere today or tomorrow. I could turn it on this afternoon, but I also want to go to Heidi, and I hate it to come home and then rush to the washing machine to hang out the laundry. Stupid, I know, because it's quickly done, but that's me. So that's all for now, not too much, but I don;t have the life of a James Bond, it's MUCH calmer and predictable(although, sometimes very strange things happen suddenly, but still they are not James Bond like, grin). Yes, I found one. It's named "A Little Hug". See it as a little hug to all of you! And there are the matching cluster too from Arlene. My hubby isn't too happy. Hmmmm, it's even afternoon already. Yes, I am late in posting today. First I was a bit later awake and then I had to see if I could find any useful information for my hubby about our dvd harddisk recorder. Yesterday suddenly we didn;t have the Guide + anymore on it.! It's using still the analogue broadcasting channels,we have it connected to cable, but for the moment they do. But hard to record a film or so, if you don;t have the Guide + system. Here in Holland it's given through by Eurosport, and most of the times worked well. We tried to reset things and such, Jan didn't change any plugs so that couldn;t be the problem. Our dvd harddisk recorder is a Philips one. If there's anybody who has any knowledge of this stuff or knows what is the matterr or knows how we can get it back, please please mail me. I get very nervous about the situation, because I am not good at those things and Jan is getting very grumpy about it LOL.And every hour or so he looks at it again, which I can understand, but at a certain moment it's enough! Then I just want to watch tv in quiet, in the evening, without checking and trying in between the dvd Guide Plus. Know what I mean?? The weekend was a nice one, we took it very easy, and I could spent a bit of time at the computer to design. But also went on with the knitting and it's slowly getting to the finish yeah! Still have to knit a part of the border for the red cover, then sew it together. I already have another project in mind. I should like to make a new blanket, made of big squares, and I saw some wonderful examples on internet. I very much like the Great American Aran patterns, but I don;t know if I can do that. Those patterns aren;t the easiest one to knit, certainly not for a not so an experienced knitter like me. Hmmm, we'll see what will happen. I do have some great other patterns already, that I can start with, and also nice they are in Dutch. So soon I will be busy with grey and white wool, and it will be a loooong project I fear. For a big blanket you will need a lot of squares. Keep you posted of the progress when I started. Yesterday Heidi phoned to hear how Jan was doing, he talked to her himself, he likes her very much. A bit later I got the phone and could ask how the school report has been from Séverine. It was really good, no minus poits at all, I am proud of her.! Today Danny will have his reseach on his knee and hopefully they will find out what is the reason of the bad functioning. I might visit them on Wednesday, it's about time we see eachother again. And we landed at the freebie for today. Today a kit that suites a bit the weather at the moment, it's named "Cloudy Day", with some great matching clusters again. 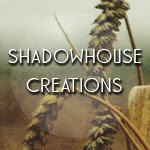 Oh before leaving you with the previews and downloads, you also should visit Linda, Edna, Snowy Su and Miriam's blogs, for some lovely freebies! Hopefully soon the dvd stuff will be solved( sigh, I hope so) abd will we be able our life in the normal way again LOL. Yesterday I was lucky when I went out for a few groceries. There was a bit of sunshine, not too much wind, fresh but not cold. Today it looks quite different. Raining, grey, more wind and it could become more fierce in the next couple of days. Brrrrr, I think I will stay in today LOL. I am still busy with the knitting, but I like it. I got a few requests to show some of it, so I made some pics this morning. Th covers really aren;t something special as I said before, but okay, it serves it's goald. First photo is from the 1rst cover I made, including the arm rests. Second is the cover I am making at the moment. This dark red one should be finished before the holidays. If you look well, you should see that it's made of all different patterns. It's a good practise and may be it will look interesting when it's finished. First have to make also two borders on it otherwise it will be too small, put them together, then give it a press with the iron, and I'll show it to you when all ready and done. The color is nice, isn;t it? Ha, yesterday I checked my bankaccount and hoorray, the sickness benefits authority transfer some money. All together it was sooner than expected. Do you realize that in only one week we have December at our front door? 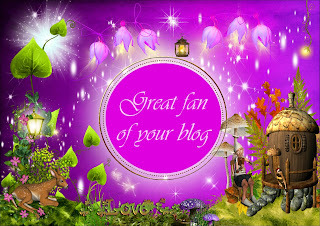 in a few days I will put up the new bloglayout, I think. 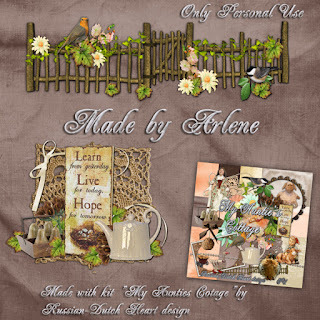 I have lots of Christmas kits waiting for you, and starting at the 1st of December, which is next week Saturday. Then is the start of the WWCSF blogtrain. I am curious to see which designers made a contribution, but I am sure you will have a great time visiting all their sites and freebies. Each time it's a pleasant surprise. Okay, not much more to tell, so better I put on the freebie. 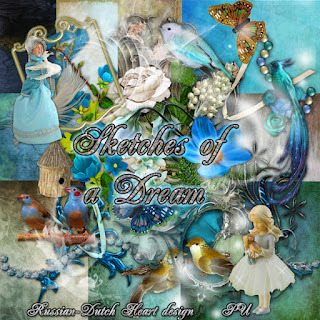 I am very happy with this kit, "Sketches of a Dream", it has really a bit of dreamy papers, it's a kit you can make fantasy layouts with, or a special memory/remembrance page, and it will look beautiful. 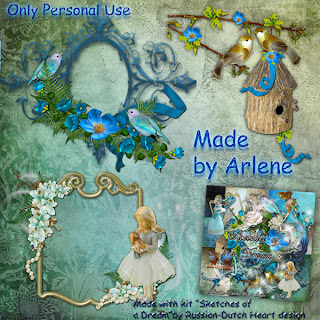 And together wuth Arlene's clusters you surely will be able to make special and beautiful layouts. Have a wonderful weekend, see you Monday. Christmaspresents need to be wrapped. We had some nice days, with not too much hustle, and how I love that LOL! Jan even got a ohonecall from the sickness benefits authority. Well he had that earlier, but it was a caal to see how it's going with him and to hear about the results of the MRI and such. He was lucky to have a nice lady, who even understood completely what he was talking about. And she informed him, that in a few days he could expect some money on his account. And that was good news. When you get sick, it takes a few weeks to get that money, but now it is on it's way. We know now what he will get as "pay"for each day, but I will wait the payment before we will smile a bit LOL. Then they will "pay"him every week, which is a nice thing. It will not be lots of money, but it surely helps to get through the month LOL. Finally some good news around here. I got a phonecall from Heidi yesterday too, she just wanted to know how Jan is doing. She also will have to deal with a husband styaing at home for a couple of weeks. Her hubby Danny, will go to hospital next week for a surgery on his knee. And today Séverine will receive her 1st school report from the new grade, so everybody is curious how she is doing. I read already on several blogs that people are busy with the Christmas presents. Well, it's about time to start with them, specially when you have to send them away. I will not have to do much, but I should check what I have so far and look around for something more. Santa will have to be a bit sparingley mith money, but still hopes to find some nice things. And it's not the amount of money spent that counts, but the thought isn;t it? It's just the knowledge somebody took time to find something nice, did an effort for it, simpy.........thought about you . Yesterday I even made my new bloglayout for the holidays! 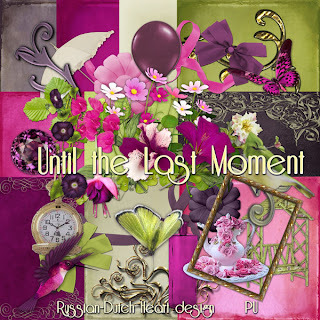 When a new layout is ready I so want to put it on, but I will be strong and wait a couple of more days LOL. So funny at the moment, I am in almost full design mood, but also am eager to get on with my knitting. Yes, the seat cover and two armrest covers for the couch are ready now, it's nothing special, but as long as I am happy with it, it's okay. But I started another one, this time in a real dark red color, and that has to be ready some time before Christmas. It will be nice for Christmastime, specially when I match it with the Christmas fleece blanket. 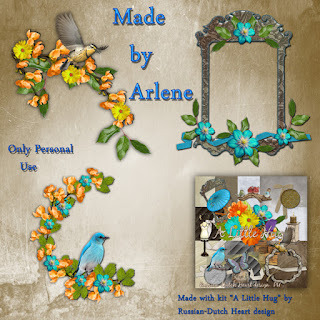 I just came from reading Edna's blog, where she has a lovely picture of a rose, one of the original color and one of a manipulated one. We too have still some roses blooming, which I think is amazing! I gave her a link to a most wonderful site for roses, and if you want to drool and drool and drool, you should take a look there too! The kit and clusters of today! Something a bit romantic, at least the name of the kit, but I think also the kit and certainly the clusters. I named it"The Flight of the Swan". Hope you can dream away for a few moments when using it for a layout LOL. It was nice to see again some speed skating after a long time. And I must say our Dutch competitors, men as well as the women, did very well. So good hopes for the real big events, like European and World Championships. I must say I was a little bit lazy these past few days. This also a little due to following the skating in the afternoon. Still did some necessary shopping, even went to the supermarket with the tram and this time it was open again. Came hope with a filled shopping car, that will last for some time. I even did a bit of ironing during the weeked, but will have to finish that today. Weather here is rather chilly, although still not too bad. Only today some mist is floating over and that makes it always unpleasant to be outside. Oh well, it's the time of the year. As long as there is no frost(well, only some during the night, but here at the coast not severe one), we can be happy. Yesterday I sent in the preview for my contribution to the World Wide Christmas Scrapbooking Blogtrain! The train will depart 1 st of December. I don;t have just a kit, but also matching page overlays and clusters from Arlene. So don;t forget the date and have some great time looking at all the contributions at the blogtrain. I am sure it will be a loooong list with names. Antoinette of Dutch Sparky is the initiator of it, already for several years. She deserves a big thank you to for all the work she is investing in it.! Still busy with the knitting and crocheting, LOL. It will not take long anymore, before it's finished. It really isn;t anything special, and not really done in a fancy pettern, but for the moment it suites our needs, hahaha. Now I must find something else to make, I like being busy when watching tv. Oh, this weekend we also had the arrival from our Sinterklaas! A LOT of little children were very nervous but also happy that finally the good man is here and they could put their shoe near the chimney at night, filled with a carrot for the horse of Sinterklaas and hopefully receive a little present or some candy in return!! The big day will be on the 5th of December, that is the date of the holiday. I can remember it well from my childhood, it was a fantastic time! Some links for you to get an iedea! Want to see more, I have found a little videao too! This video is of the "official"Sinterklaas( he has many "assistant Sinterklaas"because the old man cannot do it all by himself LOL). Sorry, the comment is in Dutch. They had again invented a great story! Sint came with a smaller steamboat, so there was no place on it for his white horse. He did sent it by post, so on the day of his arrival Sinterklaas could ride his horse. But oh whee, panic all around! The horse didn;t arrive yet when Sinterklaas was on the river already! So the police had to come to help, and with some fantasy and initiative they got the horse in time to Sinterklaas. An accident like this always happens, but that is to blame on his helpers, the Zwarte Pieten(Black Peter). Every year there is something else that happens, I love the fantasy of the people who think of it! That was the weekend here. It was a nice one all together! 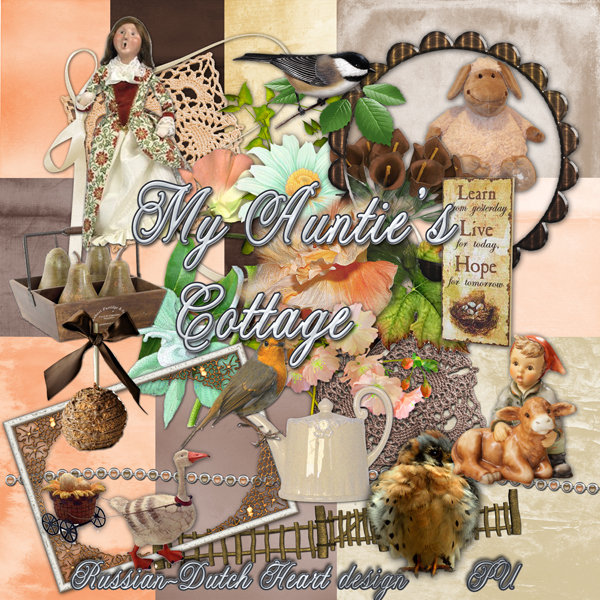 On to the kit now, A sweet kit, with even two previews of Arlene's clusters (she gets sometimes very enthousiastic and makes lots of them LOL), and named "My Auntie's Cottage". Have fun with it and have a marvellous day! The visit to the doctor was one that brought some good news. She said that the MRI results were positive, no strange things were found, so that was another relief. She still doesn;t understand why Jan suddenly holds so much fluid, and she said: "I think it will go better, very slowly, but I don;t like it when I don;t understand what is the reason". So just to be sure, she wants Jan to have a heart function test, although his heart filn taken when we were at the First aid, showed a good result. But she wants to rule out all possible things. I don;t mind that Jan is "researched"completely, always good to have a thoutough check up. For now she raised again his watering pills, but wants to keep him under close control. So he has another appointment in 14 days, she wants to monitor closely if the higher amount of these pills will not effect in a bad way his kidneys. Okay, our minds are nevertheless at peace for the moment, knowing that no strange tumors or blockages are found. Now hoping the pills will do their work quickly, and that he will loose the fluid in his feet and belly. That is the so far, so good part for now. Oh, I did tell you that I went this week to a supermarket by tram, it's one where I go from time to time, to get some stuff that is good but nicely less expensive than in the supermarket near by. Hmmmm, when I arrived I found it CLOSED! They were busy with a renovation, or something like it. Damm......... I wasn;t happy with that. Went there for nothing! Nothing to do about it, I will call them perhaps today, to hear if they are open again, so that I can make my trip. Another startle thing happened yesterday. When I woke up I put on the tv, to hear the news. But......I just had the menu screen from the decoder for digital tv, and wasn;t able to get rid of it. Ghee, what happened there. First thought Jan was busy changing some cables and such, but when he woke up a couple of moments later, he also didn;t understand why that happened. We tried some things but no luck, so I called our provider for the digital tv(same as for internet and telephone). I was lucky, I got somebody one the line after just two minutes of hold! Gave him to Jan and the guy on the line helped us right away. How it happened, we still don;t understand, but apparantly the broadcasting frequence and some code jumped to another one, which couldn't be recognized by the decoder. The guy told us how to deal with that and tadaaa...............we had back all our channels. Pffffff. that was quite a relief. Only thing is that Jan had to re-arrange the favourite channels and re-number them again, which is a pain to do, but that's done and all is well again. It seems to be a period in our life, that we get all kind of little surprises, but not the kind to get happy about LOL! I only hope, that was the last of it for a loooong time. We need a bit of "boaring"time again, how wonderful that would be, grin grin. We still cannot complain too hard about the weather, yes, it's getting a bit colder, we even might have a tiny bit of night frost, but during the day we have temps between 5 degrees C and 10 C(around 40 and 50 Fahrenheit), with very little rain and not much wind either. I can do with that kind of weather till next Spring, but I think we will have worse weather conditions later. But all this didn;t stop me from designing, which is a great thing to do to forget a bit all for a moment, yeah! 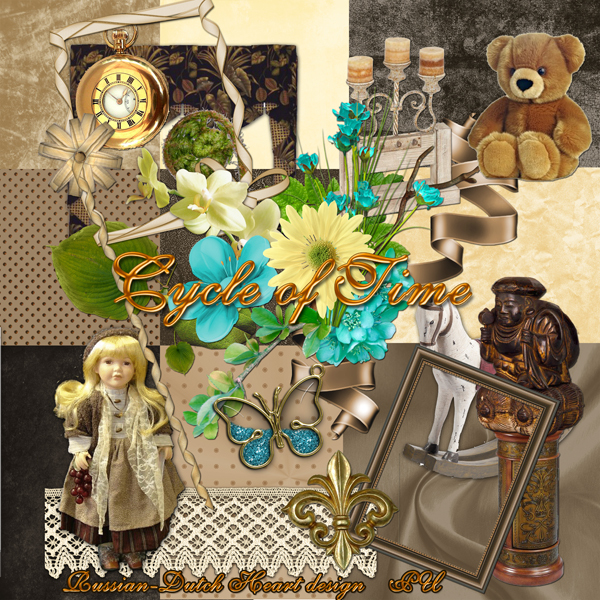 Today I have the kit "Cycle of Time"for you, and clusters to match from Arlene. I think there can be made some sweet layouts with it. That's all for today, folks! Let's start the weekend with a happy and hopefull heart, Because although there are moments in life, things aren;t going too smoothly,there are always little rays of sunlight to enjoy too, if you just take the trouble to look for them and see them. 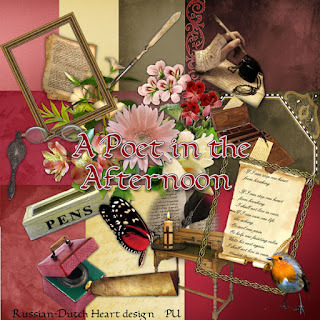 A quick post, because I have to say I made a mistake in yesterday's kit, A Poet in the Afternoon.! Lucky I have visitors who read and look well LOL! In the kit is a sheet with the poem, but I made a mistake in the name of the poet. It has to be "Emily Dickinson". So I changed the name on the element as well in the matching clusters and re-uploaded the kit and clusters. Meaning .all of you who already downloaded the kit and/or clusters should download again. (If you want to have it all as it should be). I am sooooo sorry for the trouble, please forgive me! IF YOU ALREADY DOWNLOAD A POET IN THE AFTERNOON AND OR CLUSTERS, PLEASE DO IT AGAIN AND DUMP THE OLDER FILE. Now have to hurry to get ready for appointment in hospital with Jan. Sorry again, see you tomorrow, hope to have some good news. Can you tell which holiday will come first? Things over here are about the same. Jan is going to hospital for a bloodtest, his doctor wanted to have for the appointment tomorrow. I told him I am going with him, he didn;t like it i announced it, but pitty for him. I want to hear it all LOL. I just came from reading Edna's blog and you should take a look there, because she has a fantastic cartoon there. Then I agree with Edna about this: all stores start sooner every year displaying the holiday stuff! Like here in Holland, already some weeks ago you could find lots of candy and wrapping paper and such for our Sinterklaas, which is only at the 5th of December! And almost at the same time you see already all kinds of things for Christmas! So who could tell which holiday comes first? I think it is a shame, and it also takes away a bit the excitement for the holiday to come, so long before the actual day you are already confronted with it all. But we are a little bit the same, we crapbook designers LOL! Although we do it different, we start some time before preparing our Christmaskits, which is logic, you need some time for it, still we act different: We keep them stucked away till around the start of December, although here and there you can already find Christmas stuff offered. 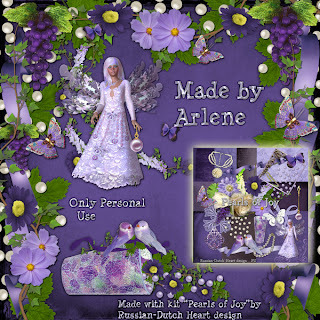 Also understandable, if you want to make cards for it yourself, to send away. And this was just an introduction to give you the link to Linda's blog, who offeres you already two lovely cards to print! I am late today, slept longer than I wished, but....................it was nice! So morning is almost done with, meaning I have to get moving and do something around here. Just will wait till Jan has left, then I can go with some speed all over to dust and wash and such. And in the mean time keep an eye and ear from time to time on tv, cause the new government is under attack in the parliament. Great, not even started to govern, already problems to push through their wonderful plans(read that last as NOT SO GOOD AT ALL, at least, large parts of it. But it will end, that everybody agrees more or less with it and who will pay the bill? Yes, we common people, and specially the ones who already have difficulties getting through each month! Sigh, isn;t that always the case? 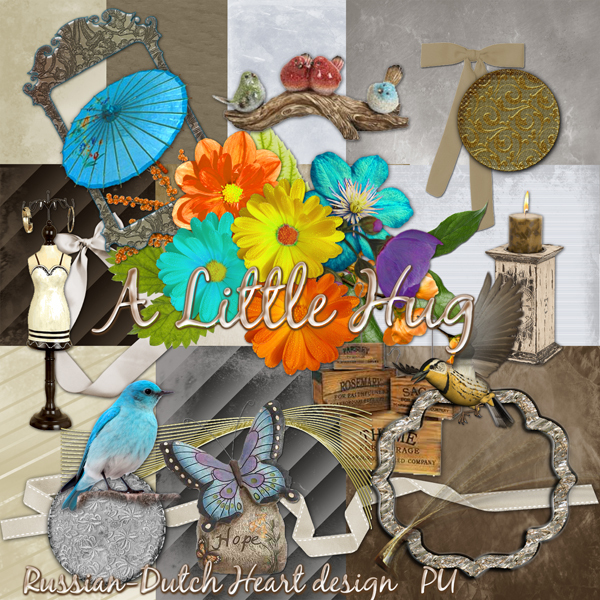 To birghten everybody up a bit I have another kit and clusters for you. The kit is named "A Poet in the Afternoon". Make some great layouts with it, but why say this, I know you will! Finished seat cover of couch. Weather looks lovely at the moment! I can see lots of blue sky, sunshine, almost no wind. I suppose it is still fresh outside but may be I'll pop out later today to catch some fresh air, if weather conditions are still the same. I worked hard this week to finish the seat cover(well, just a blanket actually LOL) for the couch and yesterday I could put it on. Of couse it's not how the couch should look, but to keep it a bit nice for a longer time, it's not a bad thing to do. I must say it looks not bad at all. Now I should make also the armrests, I think. But first I will finish the head mats. Gosh, I still have work to do! I had in fact a rather quiet weekend, yuppeeeee, and that was a good thing! The speed skating season started and we could watch the Dutch championships, and some amazing promising talents did very well! So now next week there is the first competition in the World Cup, held here in Holland in the Thialf stadion in Heerenveen. That should be nice to watch, cause that is an international competition, time to see if all known "celebrities"are in a good shape and perhaps see some new skaters with great performances! Friday afternoon Jan had his first moment outside for a long time, he made a little walk. I could see when he came back, it didn;t go yet very smoothly, but it is a try and start. With still inflated feet, it must not have been easy to walk, but hey, with some trouble he could get on a pair of shoes. Let's just see all little things that seem to be an improvement as positive things! My stash of Christmaskits is growing succesfully, ROFL! I try to do also a "general"kit in between, but it's hard, grin! But I am happy, the creative flows are a bit back again. Speaking of such, you should pop in to Miriam's blog, she is kind of back on internet, had lots of trouble with that, if I read well, she will change provider next year. But she can access sometimes internet and she has posted a lot of lovely freebies! As well as Mat did too. Then my friend Snowy has some great ones too, and Linda has made some sweet Christmascards for you. And keep an eye on Edna's blog, today or tomorrow she will post the 1st part of the November collab with Su. 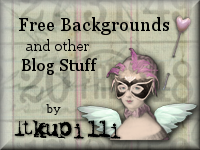 where you can find all freebies you want from all kind of designers! Somewhere this week I think I will have another photobook for you, or it may be start of next week, but today there is a serene kit for you, with really fantastic clusters from Arlene. 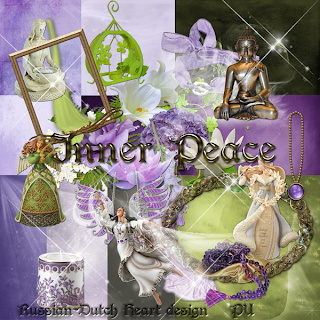 The kit is named "Inner Peace", I think so suitable for the time of year, with Christmas time around the corner. Time to work a little bit more on a Christmaskit, I think and later this morning a bit of activity, like some ironing and dusting and perhaps a quick visit to the supermarket a bit further away. But of the last thing I am not sure yet LOL. Have a lovely day and see you again on Wednesday! First thing I want to share with you is some great news I heard from an internet/blog friend I know for many years already. Her mother is getting married on Valentine's Day next year at the age of...........83!!!! Now isn;t that great news? It certainly gives you a boost to hear that and here you see that romance is of all ages, and even if you are not the youngest anymore, you still have a life and still can have some romance. You can read about it all on Valinda's blog. So if you need a little boost you should visit her an read this beautiful news.! It surely brought a big smile on my face. Oh my, our newly installed government already has big problems to solve LOL! They announced some measurements about health care, that weren't recieved well in both their parties and also not in parliament shortly said almost not by anyone! So today they have big talks together to come to an acceptable solution or change of the plan. Oh my God, couldn;t they have forseen that this plan would cause real big resistance? (and I mean REAL BIG, all through the country and through all parliament). Anyway, this weekend will be a hard one for the prime-minister and his folks, lots of hours of talk, to come up with something much more acceptable on Monday, and if they can produce something it will be discussed in parliament on Tuesday. We'll see how they wriggle out of it LOL! Astonishing! Jan yesterday, by himself, told me, it was improving a tiny little bit with him. He still has thick feet, but the legs are a bit better, not feeling like a brick wall when he touches it, his belly seems to feel also a little "softer"although still too big, but okay, he said a few words about it. He even said that today, after a looooong shower, he would dress "properly"LOL( the last couple of days he was dressed in a pair of jogging trouser and fleece pully) and perhaps will try to make a little walk outside. That certainly will not be for long, but it's a try and start. It might help too for his back-trouble he has. Might be caused by his health problems at the moment, but also, because he hardly moves around. So, no big improvement yet, but hopefully the start of it. I am not right away overwhelmly optimistic, but every inch to "a bit better" is a gain. I had a wonderful lazy day yesterday, I did nothing! Well, no things in household( apart from making dinner) or anything like it. I spent a lot of time at the computer, designing a Christmas kit. I was again invited to jium the Worldwide Christmas Scrapbooking blog train, and yes, I will participate. So good excuse to spend some time in PSE LOL. I also am busy at the moment crocheting and knitting, making some mats for our couch, to protect a bit the headrest of it. When sitting on it, you can rest you head against it, but then slowly you can see where you always have your head and that is not easy to clean. So therefore the mats. Also am knitting a cover for the couch we always are sitting on, more to protect it from the cat so that it stays a bit clean and without little holes of the cat's nails LOL. I'll see how long that will be on, but it gives me something to do during the time I'm watching tv. It keeps you busy, specially your hands, of course and that again keeps you from smoking, yes! I notice that I take less cigarettes as long as I am knitting or crocheting. Well, that's a good thing.! 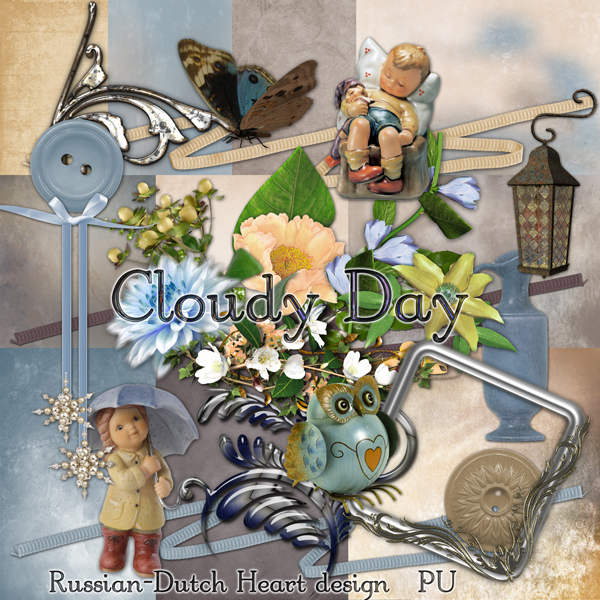 Today I will not have so much time for the computer, cause there is a little bit of shopping to do, the house can use a sweep with duster and vacuum cleaner at the leat and in the afternoon the speed skating season is starting again. 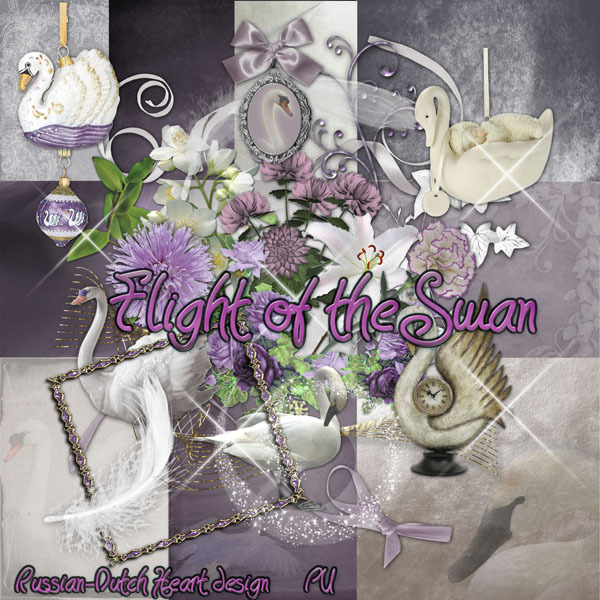 Today and during the weekend there will be the Dutch championship. You know Jan and I like to watch that, so we will be busy with that for one. 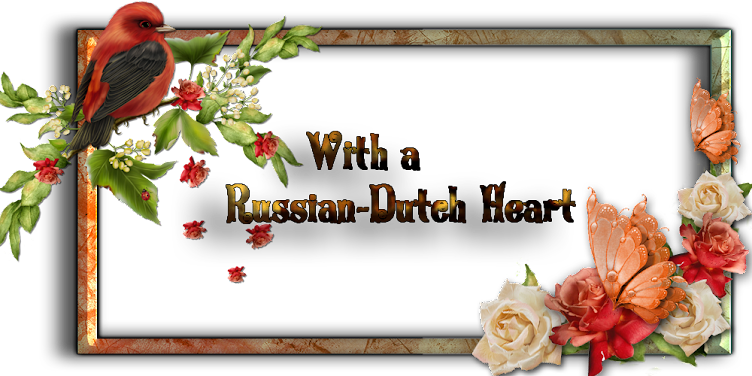 In the evening there is to watch The Voice of Holland, we start with the live shows, now every candidate can show what they are worth. There are a few, that I really like and that have "something special". 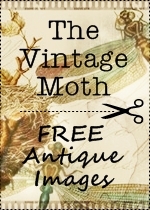 So, it's time to end this post, not without the freebie, naturally! 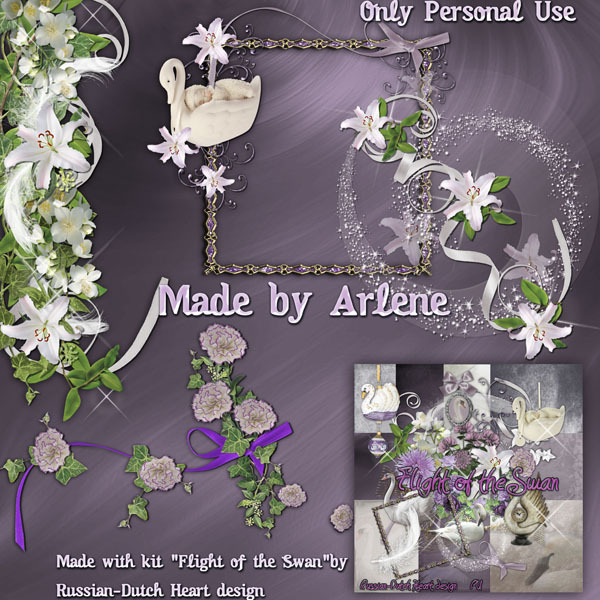 This kit is named "Untill the Last Moment", with clusters from Arlene to make it complete. Have all a wonderful weekend, thanks for your visits and all your nice comments, and for bringing a little smile into my heart! Just a few words about Jan. I thought there was going on a tiny little bit of improvement, but I am afraid that was wishful thinking. Jan isn't really improving yet, he's not feeling well, as far as I can tell. Perhaps we are a bit too unpatient, you cannot expect that all is suddenly gone and improving in just a few days, I know. We'll just have to give it more time, but it's no fun I can tell you that. Stubborn ox as he is, he does;t talk about it, but I rather would have it the other way. Oh sigh, I know how he is and have to deal with that LOL. Worst thing is, that it effects me, of course, but it shouldn;t. I have a bit low energy in undertaking things, just the normal things that have to be done in household e.g. I try not to give in to it, but the fun and real drive for it is gone for the moment. Oh, we still have our moments of laughing about something and humor isn't too far away, and that's great. Okay, enough about this, let's just keep up hope that soon there will be a change for the good! Important day it was yesterday in the US, with the elections. I think I am happy with the result, that Obama stays for another 4 years. Not that I am a real attentive and understanding follower of the politics there(we have our own problems here in Holland to deal with LOL), but I believe he can make a change, but needed more time for it. He has that time now, hopefully it will be used well. A lot is depending too on the fact, if Democrats and Republicans can find a way of working together, trying to understand eachothers point of view and find a good compromise in it, that at the end will be the best for all the nation. We too have our new government now, but the program they revealed more or less now, isn;t one to jump of joy. We are going towards hard times, lots of people will have a lot less to spend, for one thing. And that is caused by several measurements that will be taken, just to fight the crisis and the shortage in money in the governmental wallet ( meaning the state debt) so to say. So the big word is "cut back" in a lot of things. We'll just have to deal with it, it's understandable for a part, but not for all the new government is planning to do!!! It's a bit gloomy blogpost till now, I see LOL! Are there any things that might give a positive sound? Yes, a small thing but still important in daily life. Problems with phone are gone. It wasn't a provider's problem, but in our phone itself. I found it out by having a call with the service desk of our internet provider, very nice guy at the phone, and it seems that on our phone there was button for "pulse"and "tone"and that probably somehow it has been touched and put on the "pulse". Looks nice hey? Now let's hope this one will work also for many years ! It's really a phone for "elderly"people, with a good display with rather big letters and numbers, also the buttons are of a nice size and very good to see and manual is really easy. So it's perfect for me yeah!!! ROFL. 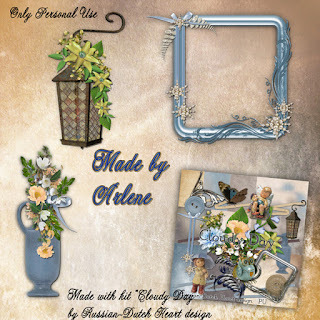 Well, as we are again in a brighter mood we should keep it that way and what better way than to finish the post with the freebie? 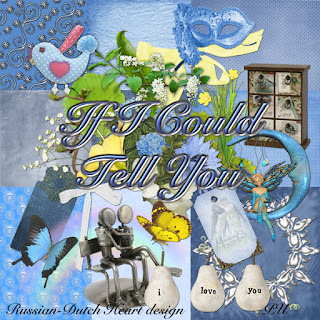 This time a one colorpallete kit, named "If I Could Tell You", and the matching clusters from Arlene. we had a bit of early rise this morning, cause Jan has to go to hospital for the MRI scan. During the weekend his legs and belly didn;t show much improvement yet, but we will have to be patient I guess. You cannot expect that his raise of mg from the waterpills will have immediate effect. But although I think Jan didn;t feel too much better during the last days ,somehow he was better too, I think it was because he had the hectic test on Thursday and the results were rather positive. That has set his mind to peace, I presume. Now just hope nothing wierd will come out of the MRI, and then we can get to work for his recovery and hopefully he will be able to get to work again. But as problems never come alone, LOL, suddenly on Friday I could not make a phonecall. The "steday"phone is working via internet, but I seem to have kind of connection, only when I start to dial a number there is a strange ticking sound and no connection with the chosen number. Lucky I have Jan's mobile phone, but at the service desk it was soooooo busy, I couldn;t get through. And then also had the bad luck it was the weekend. So I sent them a mail, but I am not very confident that I will have a quick response to that. Sigh, I will try again today, because I don;t think that suddenly my phone is broken, or kaputt, it must be something at the providers side, at least I hope so. I hope it will be fixed soon, it's very frustrating not to be able to contact anybody and visa versa.! This sweet thought and all of your fantastic support are little rays of sunlight! So I will have some things to do today, when Jan is on his way, I'll occupy the bathroom for a couple of minutes, then during the time my hair will dry, I can try to contact the internet provider, and I also have to go to the bank to bring a bill there that has to be payed. Hopefully I can find a dry moment, cause there are again rain showers expected. One happy remark": it seems( yes I still stay very cautious!) that the plumber did a good job, till now it stays all dry in our kitchen. I think it still needs a bit of time to dry, the wall I mean, but in a few days I can at least give it a bleech solution treatment, and hopefully soon I can give it a new coat of paint. But that's for later, first thing I really want to happen is Jan's recovery! Okay, enough rambling for the moment, let's go to the freebie department. 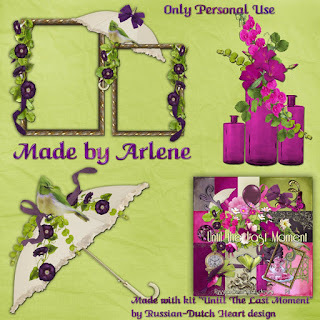 A kit in nice colors, I think, with marvellous clusters from Arlene. Kit is named"The Fusing of Seasons". A Hectic, but all together reassuring day. Yeah, Jan did call his specialist yesterday morning! She was real busy, so couldn;t talk to him right away, but she phoned back at about 14.30 p.m. afternoon. She summoned him to the emergency ward, saying he better could take a few things with him in case she decided he had to stay for the night. Wow, that was some message. So he right away put on some other clothes and so on, in the mean time I was flying around to pack some clothes and such for him. Jan said I didn;t have to go with him, but I told him in fearce words, that he was talking nonsense, and of course I went with him. If not only to hear right away results from tests and being there at his side for extra support! We were in hospital within the hour, he already was announced by his specialist, and we were kind of lucky that at the moment it was very quiet at the emercency. Right away he was undergoing all kinds of tests, like a thorax picture, blood sample, heart film, and his specialist came down too, to take a fluid punction in his belly. Oh my God, it was going all very quick, marvellous. His doctor told us she wanted him in right away for some checkups, cause she feared a bit he could have an infection. If so, he should stay in hospital to be treated right away. But thank God, thorax was okay, blood sample was okay, heart film was okay,and punction was okay, meaning no infection or other frightning thing going on. Still she was wondering why suddenly he was retaining so much fluid, and now even in his underlegs. I was glad to be at Jan's side when she did the punction in his belly, it isn;t a pleasant thing to undergo, can be quite painfull, but Jan can deal with pain, but he suddenly got into a kind of panic, in a split second he was in fear, but we got him out of it and all wnet well. He certainly wouldn;t be pleased to know I tell you this, but why not being honest? I can understand it happened to him. And it is kind of wierd,he can stay very calm when something happens with another person, but as soon as it concerns his own body, he is reacting all different. But okay, his doctor was already happy, that he didn;t have a weird kind of infection, so now she could raise his dosis of flurocimide( we call them "watering pills"LOL), she didn't want it to do just on ground of the phonecall, and see how that will work. 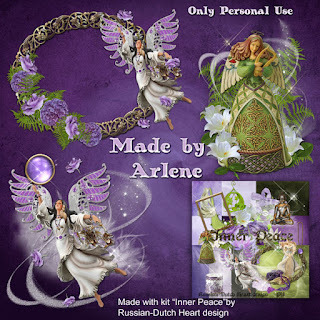 So for the moment Jan is home again, how reliefed we were yeaterday afternoon to go home again!, and still has to go to the MRI on Monday, and then he has an appointment with his doctor again on the 15th, if nothing spectacular shows up by the MRI scan of course. So for the momentwe will see if in a few days his swelling will deminish, and I hope so. Then still have to wait for the result of the MRI, but whatever there is still to come, at the moment Jan is feeling (and so I am) much calmer after the hectic of last couple of days. So that was the big news till now LOL. No, really, I am feeling much better too, had a little talk too with his doctor and if there was anything that really might have worried her I am convinced she would have told me for certain. But she keeps him under very close control! Jan will have a long sleep today, he already announced it yesterday evening, and I can understand it. All the stress ( kept mostly inside himself, because he doesn;t want to worry me, sigh!) and then the hectic afternoon yesterday pooped him out a bit. Well, sleep only will do him well, so Ilet him sleep and probably I will tackle some household chores, to work off mine ROFL. Jan and me too, of course hoping that soon the swelling in his feet will be gone and his belly too naturally, and that will make him feel a lot better already. He is hoping it will be soon, casue he wants to go back to work. Well, we could do with the money of course, because sick leave pay is very low for flexworkers and it takes a couple of weeks before first money of that will be tranferred. But most important is that he will be healthy again, and we can manage for the moment financially, so let's be happy with what we have and worry later about other things. Must thank everybody for their support, advice, prayers, everything in the last couple of days. It's not chaning the situation you are in to, but it helps to cope with it. You are awesome people! What about something completely different now? Like a freebie? Today a kit that may be is not all season related, however, with some of you experiencing still a warm Indian summer, it might not be such a bad one. 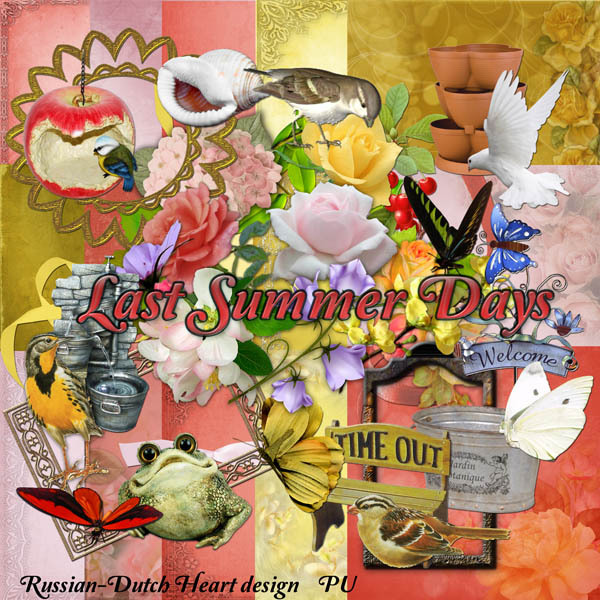 It's called "Last Summer Days"and has nice, warm colors and some flowery papers to it, as well as some more background papers and some clusters from Arlene to make it complete. Well, hoping we will have a real quiet weekend, we could do with that LOL, wishing you all a wonderful weekend and see you again on Monday. Time also for a hug to all of you too!